Marxist cultural theory underlies much teaching and research in university departments of literature and has played a crucial role in the development of recent theoretical work. Feminism, New Historicism, cultural materialism, postcolonial theory, and queer theory all draw upon ideas about cultural production which can be traced to Marx, and significantly each also has a special relation with Renaissance literary studies. This book explores the past and continuing influence of Marx's ideas in work on Shakespeare. Marx's ideas about cultural production and its relation to economic production are clearly explained, together with the standard terminology and concepts such as base/superstructure, ideology, commodity fetishism, alienation, and reification. 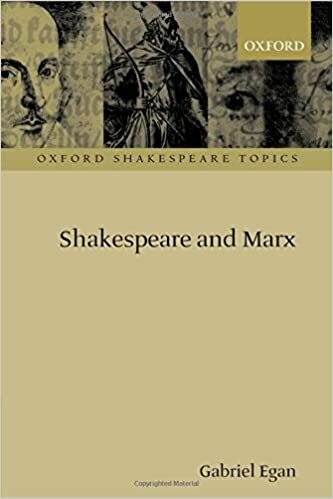 The influence of Marx's ideas on the theory and practice of Shakespeare criticism and performance is traced from the Victorian age to the present day. The continuing importance of these ideas is illustrated via new Marxist readings of King Lear, hamlet, The Merchant of Venice, Timon of Athens, The Comedy of Errors, All's Well that Ends Well, and The Winter's Tale.